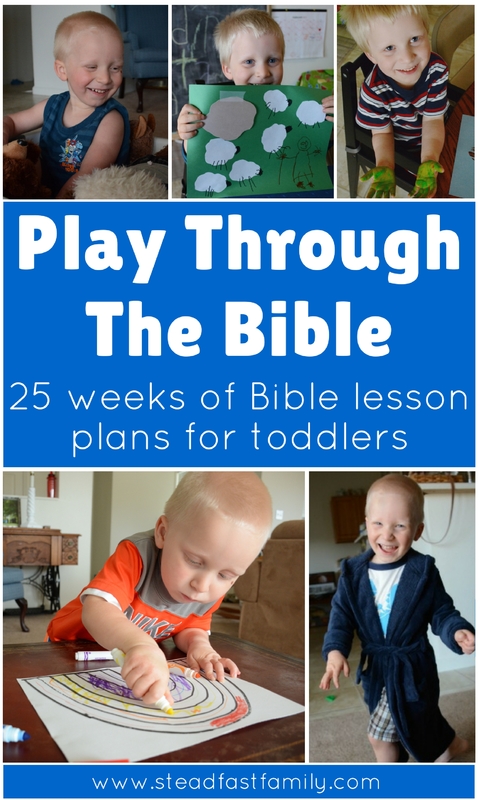 Looking for a simple, but effective, Bible lesson for kids? Keep on reading! 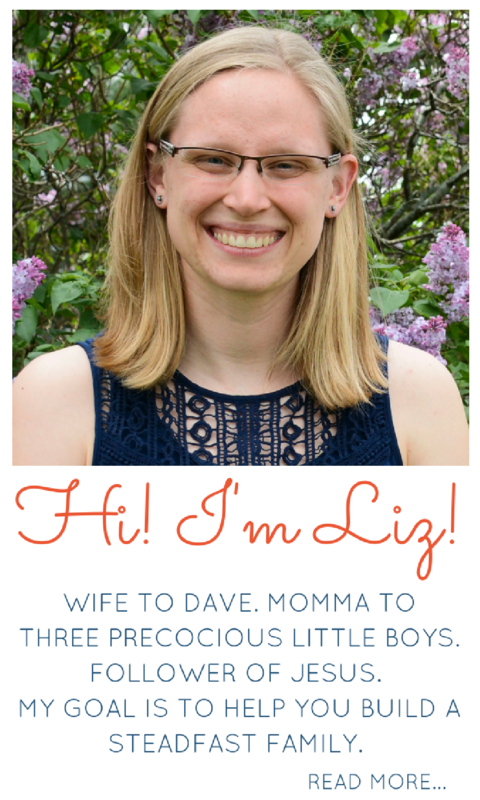 After my son turned six, I knew I wanted to begin digging a little deeper in our Bible time. He’s been through Play Through the Bible and read lots of stories from our storybook Bibles. We also read through the Tomie dePaola’s Book of Bible Stories, which was a great transition from Bible storybooks to the actual text. Now, it was time for him to begin studying from his real Bible! We’ve been doing our Bible lessons for about four months now and they have been going great! They are ultra simple, but he is loving them and learning so much. Our lessons often end with him begging me to read more! So, today I want to share with you how we are doing these lessons. Before I do most things, I like to step back and take a moment to figure out what the goal is behind what I am doing. In this instance, it is helpful to divide Bible reading into two categories: devotional reading and study. Devotional reading would be more of a worshipful or meditative experience, while study is more of a lesson style, where the goal is to learn something. Obviously the two categories overlap! When we have our Breakfast + Bible time and we read from a Bible storybook and sing hymns or other songs – we are still learning. However, the main goal of our Bible lesson time is exactly that – to learn more about the Bible and about God. And what exactly do I want him to learn? 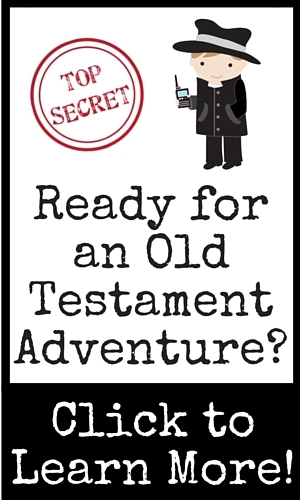 This is something that will be different for every child, due to their age and their previous experience with the Bible. For my son, my goal for him is to gain familiarity with the main narrative sections of the Bible. So, while we do stop and discuss the meaning of the text, the main goal is for him is to know the stories. 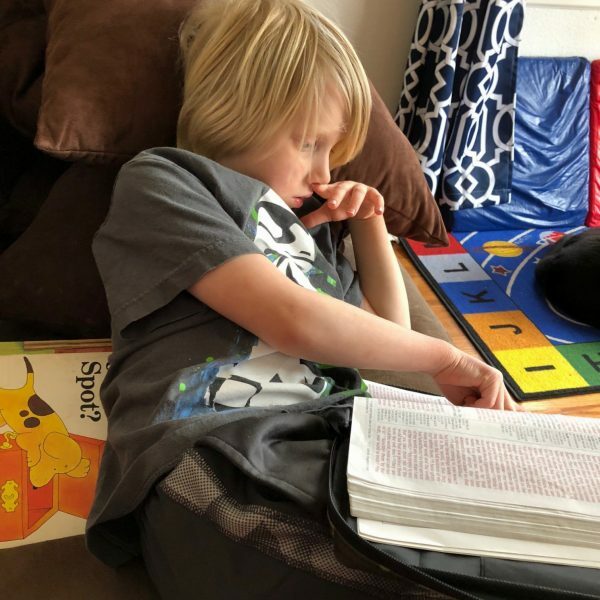 This is similar to my goal for him back when he did Play Through the Bible , except now he is reading the stories directly from the Bible, instead of a storybook Bible. And of course, even more than remembering certain stories or details, I want to fan the flame for a lifelong love of scripture. He might not remember the specifics of what we read two months ago, but if he maintains a love for God’s Word, then he is on the right track. 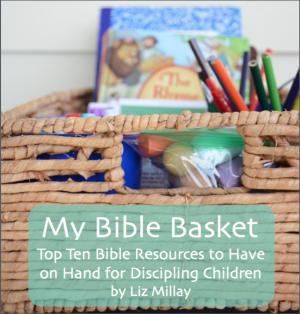 There are tons of great Bible study programs out there for kids (hey! I even wrote one! ), but for this I wanted to keep it simple. I wanted my son to feel like he could go straight to God’s Word to learn, be changed, and be encouraged! So, to do these lessons, literally all you need is a Bible. 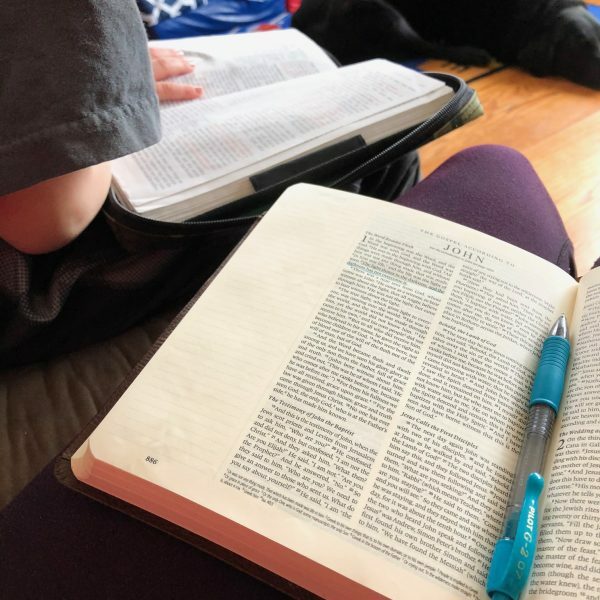 It has also been helpful for my son to keep a Bible journal, but that is optional (you can read more about how we keep the journal right here). As to where to do your lessons, that’s up to you! I have found, for us, that snuggling up on the couch has been the best spot. However, you could do them anywhere (at the table, in the kitchen, in bed, on the go…). Alright, we’ve covered the goals and what you need, ready to get started? The first thing we do when we sit down to our lesson time is review what we read previously. Sometimes I’ll ask him what he remembers and sometimes I’ll give a little review. It doesn’t need to take a ton of time, just a 4-5 sentence recap. Before you dive into the reading for the day, take just a few moments to prepare your child for what will be coming. What will you need to prepare them for? It depends on the child! Basically, you just want to give them a “heads up” of anything that might be helpful for them to know before reading the passage. Some examples are: important names, the setting of the story, unfamiliar words, etc. Sometimes it helps to write these important words on a dry erase board sitting nearby (although it’s not necessary). Don’t go overboard with details, just a few helpful tidbits – it shouldn’t take more than a few minutes. Keep the selection short. I shoot for between 10-15 verses – that’s all! If it is hard to find a good stopping point I will occasionally go longer, however, my son has a pretty good attention span. 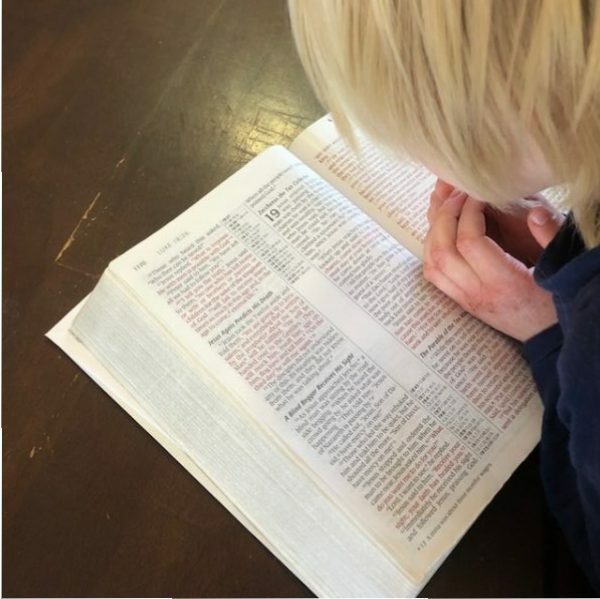 If you are just starting out, or your child struggles with sitting and focusing for longer periods of time – try sticking to closer to 10 verses. You can even read less than that and slowly work your way up to more. Skip some stuff. Yes, everything in the Bible is important! However, not everything in the Bible is important or necessary for a six year old! Use your discretion when it comes to skipping portions – for now. If needed, give a quick summary of what you are skipping. Don’t repeat yourself. If your child wasn’t paying attention to the reading, try really hard to not re-read your selection. It feels a little backward at first, because you want them to hear it! However, when they know you are going to repeat it doesn’t encourage them to pay attention next time. If you are having problems with this, give your child a moment to focus, let them know you are only going to read once, and then stick to it. If they miss something, show disappointment with a “aw bummer, it was a really great part of the story too! Hopefully tomorrow you will pay attention and not miss anything!” This approach has done wonders for my son’s ability to pay attention – and his desire to do so! Leave them hanging. One of the other benefits of reading short selections is that, more often than not, you leave your child wanting MORE! 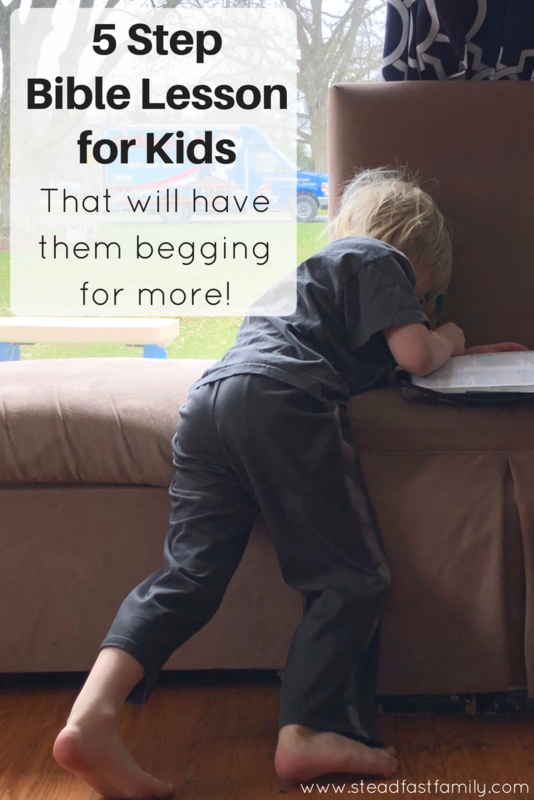 When you stop right in the middle of the story of Jacob and Esau and put it away for tomorrow, there’s a good chance your child will be begging to read just a little more! And while it is hard to decline that request (and I don’t always! ), try building up the excitement and saying “we’ll just have to wait and see!” Ending with them wanting more is an excellent way to fan that flame of a love for the Word. Then, in their own words, your child retells the story to you. Now, just because it is simple – doesn’t mean it is easy. Unlike a worksheet with fill in the blanks or answering comprehension questions, your child’s brain is doing all the work of remembering and processing the information. At first, your child’s retelling of the story might just be one sentence or they might only remember the very last thing you read – that’s okay! Resist the urge to add to their retelling or prompt them with questions. In time, their retellings will improve. 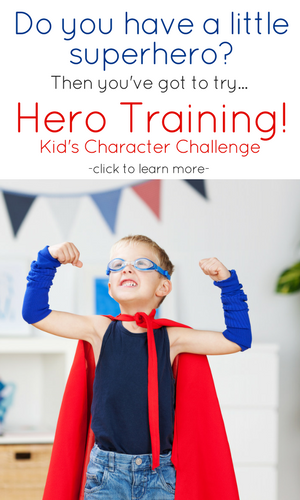 Mix it up a little bit as well by having them retell the story to daddy, grandma, or the dog! Also, if you have multiple children doing the same lesson, have them take turns retelling. After your child has retold the story, take a few minutes to discuss together what you read. Now is the time to point out what you liked from the passage or ask a few questions. Don’t make it out to be a one sided lecture, but truly a discussion. How do you think *that person* felt when that happened? How is God working in this story? Why do you think *that person* did that? Were they trusting God? How do you act like *the person from the story*? What can you learn about God from this story? Whew! That’s it! Does it seem like a lot? I promise once you get the hang of the flow, these lessons become like second nature and only take about 10-15 minutes. 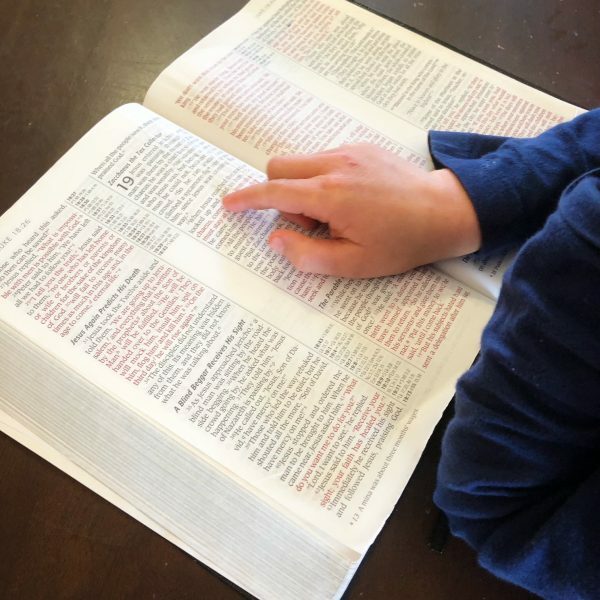 You will be amazed at how well your child is able to dig into God’s Word! If you give it a try, I’d love to hear how it goes for you! 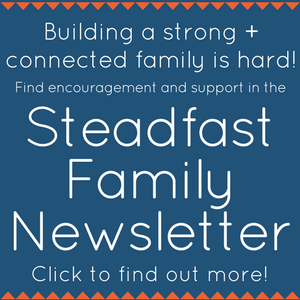 If you’d like extra help in planning your Bible lesson for kids, everyone who is a Steadfast Family e-mail subscriber gets access to Foundation, a family Bible reading plan that goes through the main narrative portions of the Bible! I also include notes as to what portions you may want to skip or summarize. You can find more out about Foundation right here! Click the image below to download this free printable bookmark with all the steps outlined!